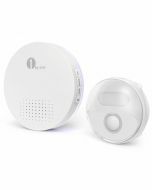 Compact Design - Place this kit’s push button and receiver anywhere, and always be notified when a visitor arrives no matter where you are in the house. 36 Selectable Ringtones - Choose from a variety of 36 different ringtones, with 3 levels of adjustable volume (High/Medium/Low) from 25-110dB. 3 Notification Modes - Press the Sound-and-Flash Button to set your preferred notification mode. Modes include sound only, LED flash only, and sound and LED flash combined. Easy Installation - The chiming receiver unit can be free standing or wall mounted using the included hardware. The wireless push button can be fixed to a doorframe with screws or using attached adhesive tapes. Waterproof push button effectively increases its security. DIY Expandability - Expand this system to fit your needs by pairing up to 5 push buttons to your receiver. Each push button can also be paired with multiple receivers to increase the notification coverage area. Easily expandable to meet your requirements! 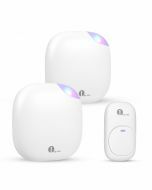 1byone Wireless Household Alert Security System is an easy-to-install and DIY home security system, which is perfect for your office, apartment or home. Just rest in absolute ease! Press the push button on the doorbell once, a sounding wireless signal will be sent to the receiver. The sound will stop as soon as the melody ends. For repeated sound, press the button again. Hold the button on, the sound repeat stops. There is a melody selector located at right on the back of the door chime. Press the selector to change into different melodies. There is a switch at left on the back of the Receiver. Slide the switch to left, the Receiver will work only with sound; slide to middle, only LED flash; slide to right, sound and LED flash. There is a volume button between melody selector and sound-and-flash switch. Press it to adjust the sound volume to be high, medium and low. There is an auto-learning code button on the edge side of the receiver. If you want an additional doorbell to work with the Receiver, just press the auto-learning code button once and the doorbell can work with the Receiver. There is a nameplate position on the doorbell. Does the push bottom part require a battery? Yes.....it is a round battery. The diameter is about the size of a nickel but it comes with the battery. I had to buy my own batteries for the other part. It takes 2 AA batteries. Hello, this item is waterproof; hope that can help you. l have the same issue .Even ı search all sources l could not find any seller to purchase a second transmitter.Sorry . Is it possible to have this door bell only flash (as in, make no sound)? Does it have a flashing light for someone that is deaf? Yes, there is a switch at left on the back of the Receiver. Slide the switch to the left position, the Receiver will work only with sound; slide to the middle position, only LED flash; slide to the right position, sound and LED flash. Hope that can help you. Can you purchase additional receivers and if so where. I need three receivers and one push button. All I am aware of is being able to buy 2 receivers and 1 push button. I would suggest contacting the manufacturer if you need more. Inside doorbell is 4 1/4" tall x 3" wide. Outside button is 3 1/4" x 1 1/4". Hope this helps! Does the push button part light up so you can see it at night? It lights up AFTER you push the button. Which, in actuality, is kind of dumb. I have a pretty good porch light, so, it not being lit wasn't a big deal.